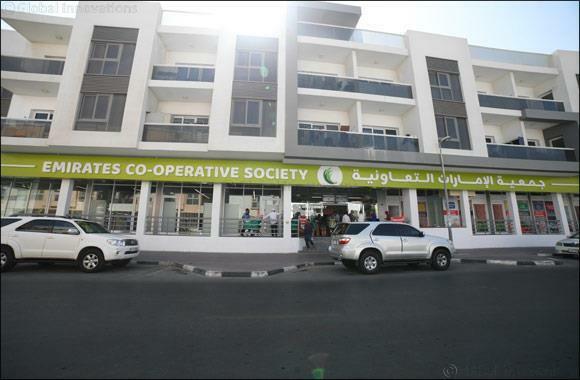 Dubai UAE, 25th October 2018: Emirates Cooperative Society UAE's leading grocer that has a chain of supermarkets and hypermarkets in the UAE, today announced their expansion plans with the launch of their new look community supermarket branded ‘Market Street' near to fish roundabout, Al Muteena, Deria, Dubai. The store is operational and currently offering great deals to boost early customers. The Chairman of Emirates Co-operative Society, His Excellency Mr. Ali Mohammed Balrahif and Board Director His Excellency Mr. Sultan Ahmed Khalfan Al Ghaith inaugurated the store, which features a brand new look and expresses convenient shopping. At the grand opening of its new concept store ‘Market Street', Mr. Mohammed Yousuf Al Khaja, General Manager of Emirates Co-operative Society said, 'We made intense changes as you approach the centrally located supermarket at Al Muteena. The change is after an in-depth feedback from our existing customers. We aspire for our stores to be at the heart of local life, bringing communities together and offering great value products and services to our customers at affordable prices. Expressing strong feedback regarding the new market place concept Mr. Sajjad Azees Marketing Manager of Emirates Co-operative Society said, During the first week of our soft launch we received an overwhelming response from our customers. They loved the easy access for their everyday essentials and because of the convenience they visited us more often than their previous supermarket. 'We are currently offering special discounts to all our customers and further discounts to our existing Mazaya members. For the grand opening we are offering a massive promotion for three days, we have dropped our prices to almost 50% on most of the products we carry. he added. The 8000 square feet community ‘Market Street' is inspired from a traditional market place, which is a centrally located area. The layout of the supermarket is very new unlike the existing supermarkets across the UAE. It's like walking through a street and visiting individual shops for Fruit & Vegetables, Deli, Meat, Fish, Groceries, Household essentials, etc. This new format of the Market Street enables direct to consumer shopping for everyday needs, catering to all people living in the locality. ‘Market Street' is reinforcing and bringing back that community spirt and feeling, in the design concept that was created by 5ivedesign. Emirates Cooperative Society has planned this store to move away from the conventional way a supermarket would look like, and have created a shop for each of the categories they carry. Market Street is adding value to shoppers by giving them a better shopping experience. The focus is on affordability, value offers, and product range. Emirates Co-operative Society was established in 1994 in Dubai, United Arab Emirates in accordance with Co-operative Society law.